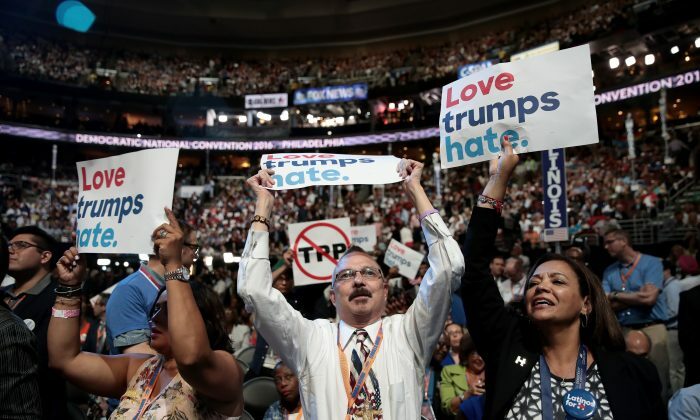 On the first day of their national convention in Philadelphia, the Democratic party was mute on the topic of terror and terrorism, and framed a rhetoric opposite to their rival Republicans. “61: Number Of Speeches At The DNC Tonight,” the Republican National Committee wrote on its website. “0: Mentions Of The Global Terrorist Threat Posed By ISIS,” it continued. The fact-checking website PolitiFact agreed with the assertion, noting that the only mention of terrorism was made in a video that quoted Hillary Clinton’s speech after the mass shooting in Orlando, Florida, where the gunman professed allegiance to ISIS before killing 49 people in a gay nightclub. However, that video wasn’t part of the 61 speeches mentioned by the RNC. On Tuesday, Newt Gingrich pounced on the lack of terrorism-related talk at the DNC, calling it a “genuine danger” to the safety of United States in a Facebook Live chat. “The morning after, nobody had mentioned ISIS, and two ISIS terrorists behead an 84-year-old priest in Normandy. I think that’s worth paying attention to,” Gingrich said. “It’s worth reminding people that the world is dangerous. Donald Trump also criticized the convention on his Twitter feed. “Dems don’t want to talk ISIS b/c Hillary’s foreign interventions unleashed ISIS & her refugee plans make it easier for them to come here,” he tweeted. Dems don’t want to talk ISIS b/c Hillary’s foreign interventions unleashed ISIS & her refugee plans make it easier for them to come here. Criticism of the Democratic convention comes less than a week after the Republican National Convention ended in Cleveland. One of the key themes by the speakers at the Republican’s convention was fighting terrorism, and highlighting the terror attack in Benghazi in 2012 where speakers—including a mother one of the victims—held Clinton personally responsible. The Republican convention faced the criticism that it was too “dark,” “negative,” and full of “doom and gloom,” although Gingrich dismissed those criticisms pointing to recent news in the media following the recent spur in terrorist attacks in Europe. While there weren’t any mentions of terror and terrorism on the first day, and that the theme of “United Together” didn’t call for discussions of foreign policy or terrorism, there were still three days left for the Democrats to address the topic.